I am honored to have had the chance to interview A.E. Howard! I hope you all enjoy the interview and be sure to check out her books! I was luckily enough to be able to read Flight of Blue and I have to say, it's wonderful. I enjoyed the fantasy and adventure elements that Howard brings to life through her setting and characters. I was instantly transported to a different world that could exist within our own reality. This middle grade fantasy novel is perfect for readers of all ages, but especially younger readers who are hungry for action and adventure. Kudos to A.E. Howard and her first novel for bringing reading to life for not only myself, but for the many young readers out there who are just learning how fun reading can be. I personally loved this novel with all of its fantastical elements from a magical talking opossum to the larger than life settings and scenes that Howard creates. I look forward to the next book in this series! First things first, why do you write? To silence the voices in my head... That came out creepier sounding than I meant... But really, I have these characters that live up there and they want their stories told, so I write. What do you do to prepare before you actually begin writing? Music, tea, coffee, etc.? Coffee, sometimes music. Clean desk when possible. Do you have a writing routine/schedule? I write when my son naps. The spark, the new story suddenly winking into existence in the back of my head. What are the books that you are promoting? I have a middle grade fantasy series called the Keeper of the Keys Chronicles. 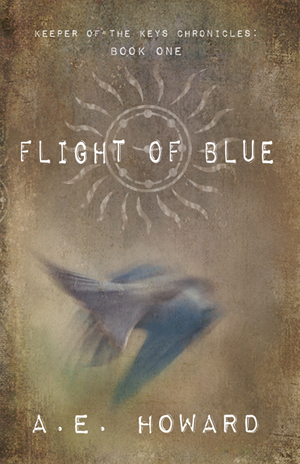 The first full-length novel, Flight of Blue, came out last year. There’s also a spin-off novella told from the viewpoint of the curmudgeonly Opossum sorcerer, Reginald, called Reginald’s Tale currently available. Book 2, The Guardians, will be available Sept 3rd. The series in one sentence goes something like this: With the fabric of the world disintegrating, one boy must stand between the Darkness and everyone he loves. When a wounded Opossum on the side of the road speaks, Kai’s view of the world is shattered. With the help of his friend, Ellie, he embarks on a journey to return the Opossum to his home. But a cursed traffic light, a rip in the fabric of the world, and an injured sorcerer on a quest for revenge means their journey only leads to more questions. As the Realm of Darkness threatens to push through and make his world vanish, Kai must uncover his parents' past to find a way to close the rip between the Realms. But truth is more dangerous than illusion. As Kai struggles to wield his newly discovered magic, he must choose between accepting a role he hates, but was born to play, and abandoning everyone he loves. Who is your favorite character from your novel? Reginald the Opossum sorcerer. (I have to say that or he’ll curse me). 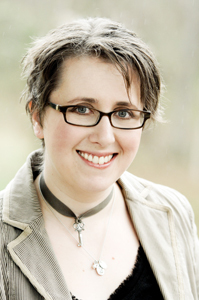 Why do you write for the Middle Grade audience? Because it’s what I like to read and this series in particular, because I like kids and like giving them stories where compassion, loyalty, courage, and friendship can stand in the face of great evil, and overcome. Any advice for aspiring authors who would like to be published? Keep writing, don’t give up, consider Indie publishing, but don’t sacrifice quality for ease of publishing. Is there anything that you are working on currently that we can be expecting? Besides finishing book 3 of the Keeper of the Keys, I’ve got part of a first draft written on the first book of a young adult dystopian trilogy called Obliviate. In the first book, two teens, a boy and a girl, and a young girl of about six or seven wake up with no memory of anything before that moment. They are taken in by a community with a strict and strange views and try to find their place. Called only First, Second, and Third at the beginning, they are told they will be assigned names as they are assigned places, but they can't help but wonder, is there more? And where are they, and what happened to the world they came from? Since your second book is coming out this September, is there anything you can let readers know about this one? The Guardians: His parents are trapped. The Guardians are missing, and without them, rips are opening all over the world. Stalked in his dreams by a sinister figure known only as the Dream Walker and pursued by Name Monsters who have teamed up to fight them, will Kai and his friends be able to outwit the forces arrayed against them and free the Guardians in time to close the rips before the Realm of Darkness spills out in the Middle Realm? And will Kai be victorious in the war being waged for his mind while he dreams? 2. Coffee or Tea? Coffee. Lots and lots of coffee. 3. Book or Kindle? Depends on my mood. Love a real book, feel, smell, and all that, but I love the ability to carry a ton of books on one skinny tablet. And I especially love how the kindle has made it possible for me to read a ton of awesome Indie authors! 4. Romance or Thriller? Fantasy, Adventure, or Sci Fi please :-) Romance and thrills on the side. 5. Favorite book? Books. I love them. Not all of them, but far too many to be exclusive. 6. Favorite movie? Same with movies. You caught me, I’m a book and movie polygamist for sure. 7. Favorite author? Madeleine L'Engle, C.S. Lewis, J.R.R. Tolkien, J.K. Rowling. 8. iPhone or Android? iPhone. 9. Favorite color? My goodness. All this commitment. I’ll commit to my current favorite color scheme: Mustard and grey with dark turquoise accents. Other colors I’m consistently drawn to are most colors of the earth, sea and sky (blues, turquoises, greens, greys and browns, with pops of yellows and reds and burnt oranges). Where can we buy your beautiful books?